Perennials and grasses, what a perfect pair. Photo courtesy of Sunnyside Nursery. I don’t know about you guys, but I can hardly believe that it is October already. With all this climate change I am beginning to think that maybe October will be my favorite fall month. I read somewhere that our rains are coming later and ending earlier, even though the total rainfall is about the same. What this means is that not as much rain gets to soak into the soil, so our summers are getting drier. Making our soils more absorbent by continuing to apply layers of compost will help mitigate this phenomenon. WATERING: If you think the recent rains have replenished the soil moisture, think again. Despite the scattered rains we have received this month, the ground is still very dry (stick a shovel in the ground and you will see for yourself that, at best, only the top two inches of the ground is moist). While plants use less water in the fall, they will still appreciate a nice soaking a couple of times this month. Containers, of course, will still need water on a regular basis. Don’t put the hoses away just yet! LAWNS: Again, with climate change, October is becoming an excellent time to resurrect the lawn. At a minimum, apply a good organic slow release fertilizer to get things rolling. Eliminate any summer weeds either by hand or with an herbicide (I am not a fan of “weed and feed” products, so either weed or feed but don’t try and do both at the same time). You can also aerate, de-thatch, and reseed this month. One more application of food in November should carry you all the way through the winter. 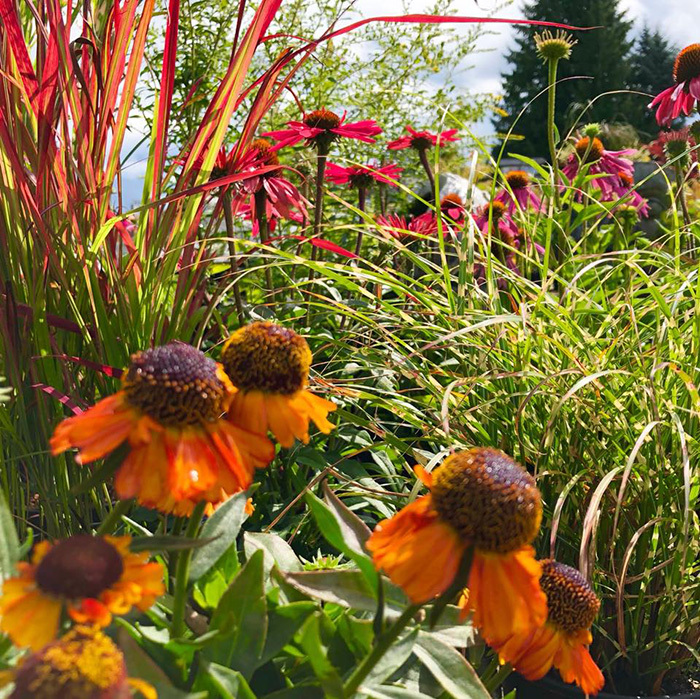 PERENNIALS: There are still some late bloomers that look great: asters, mums, Japanese anemones, cone flowers, Russian sage, sedums, and toad lilies - to name just a few. Ornamental grasses are also just spectacular now. Enjoy the last blooms of the season and don’t rush to tidy things up. There are lots of seeds in those old flower heads that the birds will enjoy. Wait until the first frost to really start cleaning up the perennial beds. In fact, you can even wait until mid to late February to do it, just be careful of emerging bulbs. CONTAINERS: Even though my summer containers still look pretty darn good, I have to confess I am sick and tired of them and am ready for a change. Pull out the old stuff, replenish the soil, add some organic fertilizer and refill them with evergreen hardy perennials, ground covers, ornamental grasses, and even shrubs for the winter. For color, of course, nothing beats pansies and violas. BULBS: Plant them this month while the soils are warm and there is still a good selection. A little effort this month will give you a huge reward in early spring, when we all are yearning for some color other than grey. VEGETABLES: Plant fall crops now and control winter weeds by spreading a one-inch layer of compost over the top of the soil. Root and leaf crops can both be planted this month. Garlic is a must to plant in the fall. For the best results be sure to add a generous portion of organic fertilizer. October is still good gardening weather; so don’t miss the opportunity to get some chores accomplished. Later in the month I will talk about “putting the garden to bed,” but for now keep at it. Sunnyside will be hosting a free class, “Designing With Bulbs For Spring.” Saturday October 6, 2018, at 10am.